Electric Outlet Air Fresheners PROBLEMS! Electric Outlet Air Fresheners PROBLEMS. Can’t tell you how many times I see this on my customer’s carpet. 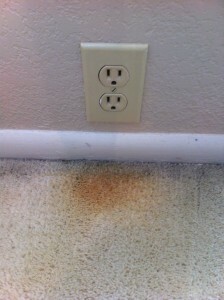 Here’s a perfect example of how electric outlet air fresheners cause permanent staining. Don’t let this happen to YOU. If you must use these types of air fresheners don’t attempt to open and pour in new liquid while holding the unit on the carpet. These spilt oils will damage your precious carpet.